★ FIT MORE FUNCTIONALITY: A variety of box wrenches, hex drives, flat and Phillips screwdrivers, oxygen tank wrench, carbide glass breaker, sim card pick, cutting hook, socket drive adapter, and bottle opener. 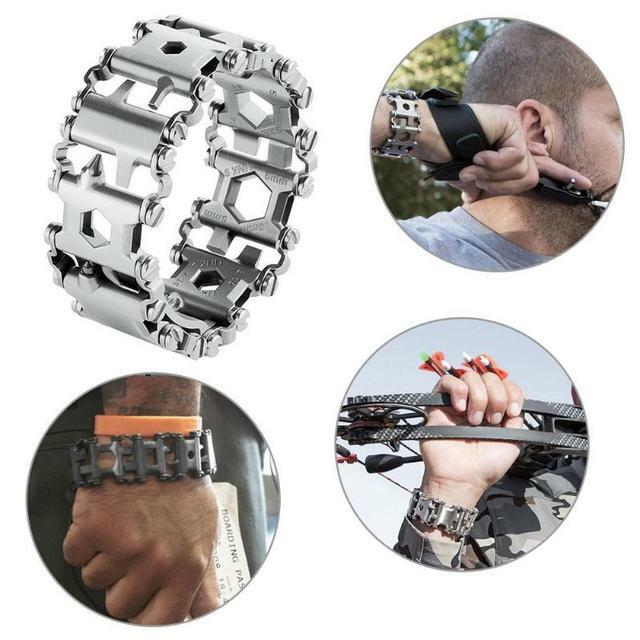 ★ WEARABLE TREAD BRACELET – Made from 402 stainless steel, it could fully customizable to fit your needs and your wrist size. 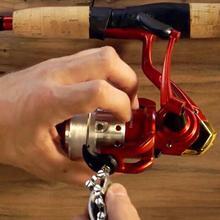 Simply add or remove links in quarter-inch and half-inch increments to fit. ★ SUITABLE FOR – Sailing, Travel, Camping, Hiking, and any other Outdoor Activities. Wear your Emergency Bracelet everywhere so you’re always ready. It is so cool and so useful for your life. Really a great Christmas gift / Birthday gift for your father, your husband your boyfriend. 2. 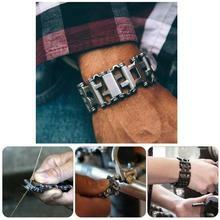 You can randomly combine all 29 steel chains for different functions, or reduce some sections for a bracelet. 3. 29 different tools in 10 links can be assembled multiple ways to customize this multi-tool to meet your needs. 4. Made of strong stainless steel, it is a tool ideal for outdoor camping or hiking. 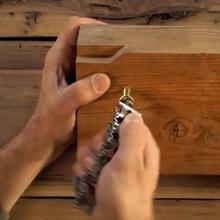 Application: hiking, camping emergency tools, home repair gadgets, etc. I really like this bracelet. It is very comparable to the Leatherman competitor. The price is also reasonable at $60 vs. $174! It fits reasonably well and there are adapters for it to attach a watch piece of many sizes. I got 20 mm brackets for mine! I will be buying another one for myself and most likely one more for a gift. Item was as described. 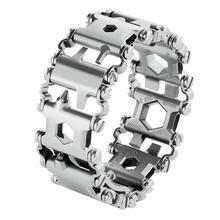 I owned one of these but made by Leatherman, I lost it a while back and didn’t want to pay leathermans price again. So far this has been a suitable replacement. 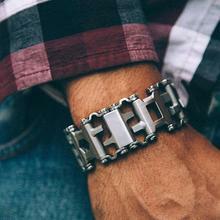 Comparing this to leathermans bracelet, they are almost exactly the same. This one doesn’t have a company logo on it, and it isn’t made of the same steel, but it’s still a strong and sturdy tool. Links are easy to remove to properly size to my wrist since the overall inside diameter is quite large, same as leatherman. Item arrived before shipping estimate. As an update, the original package was marked as being black, the bracelet inside was silver. The company has since sent a black one to me at no charge. 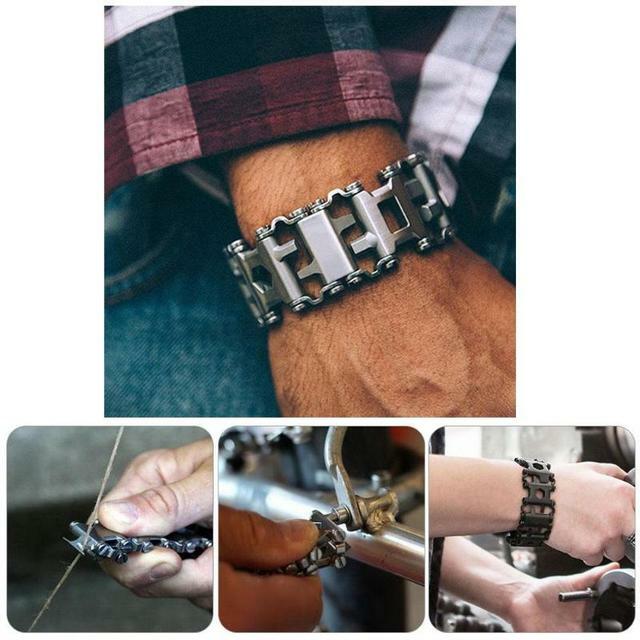 The black CyberDyer Multitool Bracelet 29 is as well made as the silver. Thank you. I actually couldn’t be happier with this purchase. Great quality, and it looks well made. I love being prepared. I couldn’t get the Garmin tactix to fit the adaptor, but could canabilize an old Garmin watch band to make it work. Very generous refund policy with the adaptor. I have see the name brand one and this one appears of the same quality. This was gift for my husband and he really like all the different tools. Love the design and weight .